With two claw-shaped rotors turn in opposite direction inside the housing. Due to the shape of these claw rotors, the air or gas is sucked in, compressed and then discharged. The claw rotors do not come into contact with each other or with the cylinder in which they are rotating. Tight clearances between the claw rotors and the housing optimize the internal seal and porvide a consistently high pumping speed. A synchronization gearbox ensures exact synchronization of claw rotors. The rotary claw operation principle reduces energy consumption considerably in comparison with conventional vacuum pumps so energy costs are reduced. Due to their near maintenance-free operation, a decrease in operating costs adds to the savings; no maintenance downtime occurs, no wearing parts or operating fluids need to be changed – only a gear box oil change is recommended after every 20,000 hours. 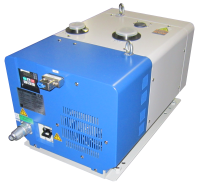 When compared to conventional vacuum pump solutions, Mink claw vacuum pumps can save up to 60% on energy and operating costs. EV-A pumps are manufactured by Ebara Technologies of Japan. 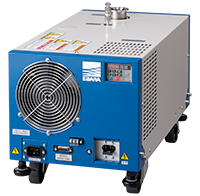 The Model EV-A03 air cooled dry pump offers high pumping speed (9 cfm) and high water vapor pumping (250 g/hr) when used with the optional gas ballast valve. The pump is available with optional casters/levelers. 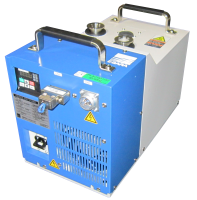 The Model EV-A06 air cooled dry pump offers high pumping speed (21.6 cfm) and high water vapor pumping (350 g/hr) when used with the optional gas ballast valve. The pump is available with optional casters/levelers. The Model EV-A10 air cooled dry pump offers industry leading specifications in an air cooled dry pump. The pump comes standard with four lockable casters/levelers.